Choose the Contour Effects 2 by City Color for a highlighter and bronzer in one. Everything you need for contouring is already here that you don’t need to search for more. The Fit Me! 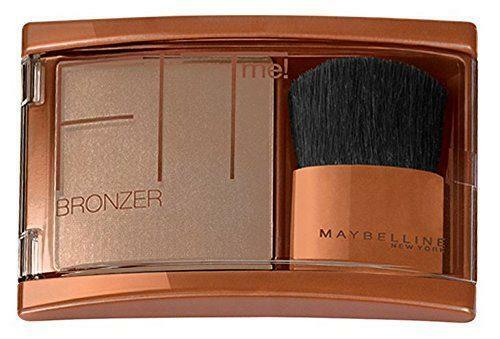 ﻿﻿Bron﻿﻿zer by Maybelline is well-loved by girls with fair skin. It gives a natural and fresh finish that’s long-lasting and doesn’t easily wear-off. The Velvet Contour Stick by L.A. Girl applies like a dream. This cream bronzer comes in stick form that you can easily swipe on your skin and build until you reach your desired finish. For a pretty yet unique (in a good way) packaging, go for the Honolulu by W7. It comes little cute box armed with its own brush applicator and is the best drugstore matte out there. The Retractable Kabuki Brush by Real Techniques is perfect for people on the go. An all-in-one brush, it can be used to apply anywhere from your powder, highlighter, bronzer, or blush. There is no doubt this is the best bronzer and highlighter for contouring. Regardless if you’re an amateur or a professional, you’ll find this handy for all your contouring needs. Made for those who love contouring, it comes with a subtle-colored highlighter for a shadow that’s natural-looking and a soft-colored bronzer that adds warmth to your face. Great for all skin types, this best bronzer for contouring cheekbones has a complete guide on how to contour like a pro. It has two different bronzer shades to match your current mood. It comes in a sleek and sturdy black plastic with a built-in large, rectangular mirror inside while its name and the image of a contoured face on the outside. A clip closure has also been added. These pressed powders are highly pigmented and are blendable for an effortless and flawless result every time. The pans are even bigger compared to the original so you get more product. If you’re always asking yourself what is the best bronzer for contouring, then the search is over. Everything you need for contouring is here and there is no need to look for another. This is by far the best bronzer for contouring fair skin. Tested by dermatologists, this powder bronzer has wear that lasts up to 6 hours, is non-comedogenic, and is free from any fragrance. Easy to apply, this product gives out an even finish that leaves skin vibrant-looking and full of life. It is lightweight and very blendable for a natural and healthy-looking sun-kissed look. This best cheap bronzer for contouring comes with a flimsy packaging (sorry for being too honest.) Anyway, it has a clear plastic top that opens sideways to get to the actual product. It has a brown bottom with two sides: the left is where the powder is, while the right is where the small brush is. It has a bit shimmer in it, but just enough that it doesn’t make you look glittery. Another thing we didn’t like is that it is so densely packed. This makes it hard to pick up any product since you have to scrape off the topmost layer just to get some powder into your brush. We love this best cream bronzer for contouring because it easily blends into the skin for that soft, powdery finish. It is also infused with grape seed and jojoba oils that help moisturize skin. This cream bronzer comes in 3 different shades and in stick form. Contouring has never been so easy because all you have to do is swipe it on your face, blend it in, and you’re good to go! Can we just mention how adorable this thing is packaged? This best contour bronzer comes in a small, fat stick shaped like a dome and has a see-through cap so the shade can easily be seen. Texture-wise, it is so velvety and soft (hence the name.) It is very pigmented, highly blendable, and has a nice finish that can last the whole day with a subtle touch of shimmer in it. This product doesn’t settle into fine lines and offers a streak-free finish. And considering how cheap and affordable this product is, we really think it is a good buy and you can’t go wrong. This is the best bronzer to contour cheeks because as mentioned, it is shaped like a dome. Compared to powders, it’s easier to create fake shadows on the hollows of your cheeks. This right here is the best drugstore matte bronzer for contouring. It comes in a cute little box and even has its own brush applicator, perfect for those quick retouches while you’re on-the-go. Nicely pigmented, it is soft to the touch and not densely packed making it easy to pick up the product. It has a natural finish, isn’t orangey, and can be used as a contouring powder, too. Blendable and buildable, this best powder bronzer for contouring has a slight red color to it. This is no biggie for us, because if you have tan skin, it makes your bronze more realistic. A dupe of the Hoola Bronzer by Benefit, this product doesn’t contain any shimmers in it which is why we really love it. It also lasts the whole day which is quite impressive considering its price. This is really the best contouring bronzer for tan skin because it doesn’t make the color look fake. It actually helps enhance your tan, so you end up looking sun-kissed and not sunburned. Being a versatile product makes this the best bronzer brush for contouring. It can be used to apply almost everything in your makeup kit, from your powder to your blush to your bronzer. Designed by professional makeup artists Nic and Samantha Chapman, this brush is made from 100% cruelty-free materials. It also has synthetic bristles smoother than most makeup brushes. Stop asking yourself what is the best bronzer brush because the answer is right in front of you. Its soft fibers create an HD and flawless finish whether indoors or under natural lighting. Shedding is not a problem when it comes to this brush. It also has a slight angle to it which makes bronzing a breeze, and has a white end so you’ll know when it’s time for some cleaning. And can we just say how pretty the handle looks? It comes in a pink metallic color and is retractable, which makes it perfect for travel purposes. Everybody is crazy of contouring these days—we know we are. Achieving the perfect contour takes a lot of practice, but once mastered, you can be an epitome of beauty in an instant. But have you seen people and think that, uhm, something’s wrong with their face? It’s probably their contour, so here are 5 common contouring mistakes so you don’t end up doing the same. Unless you’re a Hollywood A-lister, always having your contour “on point” isn’t necessary. You may think you applied it in all the right places, but that may not be the case in reality. According to makeup artist Vincent Oquendo, those strong lines can still be seen in real life. As weird as it may sound, those lines make the nose look as if it is behind bars. The solution? Tone it down a little bit and go for a subtler contour of the cheekbones. Contour powders and bronzers are two separate products, so if you decide to switch one for the other, prepare yourself for a disaster. Bronzers add warmth to your skin and are applied where the sun naturally hits (usually above your cheekbones,) while the latter are applied BELOW the cheekbones to add more depth. So next time you go makeup hunting, make sure to pick the right shades appropriate for these uses for a more natural look. Contouring and highlighting are like makeup’s yin and yang. The former creates shadow and contrast in your cheeks’ hollows while the latter makes cheekbones pop when applied on top. However, have a gentle hand when using shimmery powders as highlighters draw attention to areas they are applied. Too much shimmer means goodbye to the fake shadows you created. You can fix this mistake by using matte powders for contouring and not bringing the highlight too forward or too low. Avoid using a foundation that’s very emollient to prevent the contouring powder from sticking to it. This way, you won’t end up with a patchy application. Streaks and patches are impossible to blend out, so stick with the “prevention is better than cure” method. Before contouring, dab a tissue on your cheeks or dust some setting powder on your base to remove excess moisture. Darker isn’t always better. Like foundation, contouring powders must adhere to your skin color. If you can see the dark lines when you stand in front of a mirror, it means you’ve gone too dark. To fix this, go for a lighter shade that’s easier to blend in. Besides, a natural-looking and subtle finish is what you’re aiming for, right? Bronzers can either make or break you. Applied correctly, you can look like a radiant, sun-kissed princess but when not, you’ll look like you’re dressed for a Halloween party. The Contour Effects 2 by City Color is the winner of this round as the best bronzer for contouring. This palette comes with a highlighter and a bronzer for your contouring needs, whether you’re a professional or beginner. It is great for all skin types and also has a step-by-step guide included. This product is very cheap as well so if you’re new to contouring, this is a good place to start.